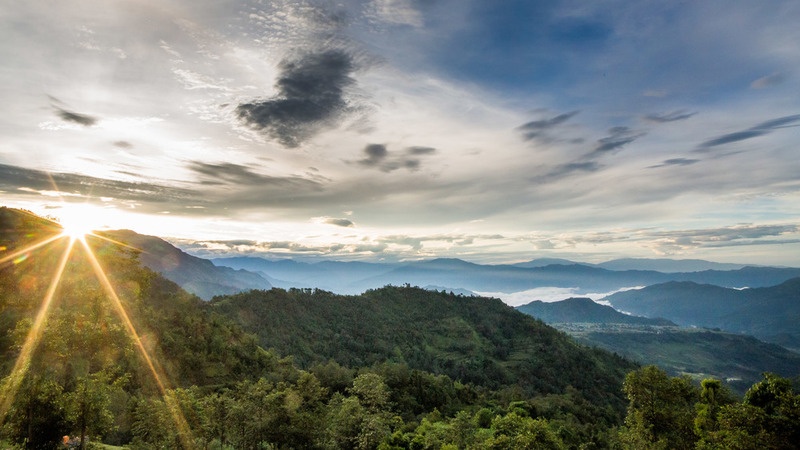 The first glance of the Solukhumbu District. This is the view waking up in Okhaldhunga. Our visit to the village of Necha had two goals. The first was to work for Micro-Care Nepal Foundation establishing our projects in education, health, agriculture and giving clothing to poor families. The second goal was to research a small trek that we are developing. 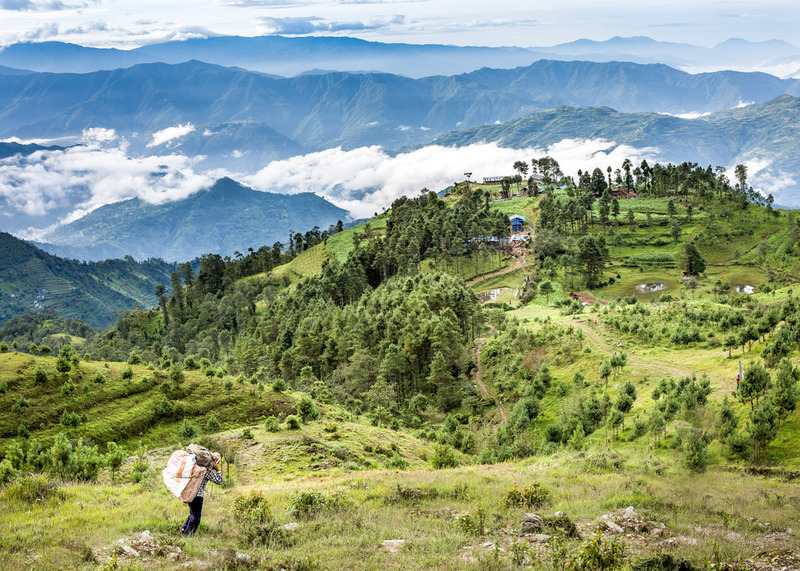 The idea of the trek is to bring clients to visit and support the places where Micro-Care Nepal Foundation is establishing projects. Our walk to Necha took us through villages and areas we want to include in this trek. We checked out places where we could stay and searched for special highlights to make it an unforgettable cultural experience with an emphasis on organic produce. After a 2 hour walk, the magnificent view from the little village of Deorali. Our porter on his way down, carrying clothing to give to poor families and 2 laptops for local schools. We had to take a porter to carry our consignment of clothing because we already had heavy bags to carry. I always carry a bag of about 17 to 20 kilos with my MacBook pro, external backup disk drive, 2 cameras, 24 mm wide-angle lens, 50mm all-round lens, 85 mm portrait lens, batteries and charger and flash with trigger. This time I was also carrying a little pocket printer to print wallet size photos to give directly to people. Rohit with our porter on their way to Deorali. Our original plan had been to put our luggage with Rohit’s uncle's luggage on a tractor and bring it by road to Necha. Unfortunately, often in the rainy season the roads in this area are destroyed by landslides caused by all the water moving down from the mountains. At this time the road was destroyed so we asked around for a porter. Prices were very high but we were lucky to find a man who had come to Okhaldhunga with a load the previous day and was now on his way back to Necha anyway. In the morning he was waiting for us. He didn’t speak any English and seemed quite old. During the day however I was to discover that he was very strong, carrying our 3 big 10 by 15 metre plastic sheets plus 15 kilos of clothing - probably 35 kilos in total. At some point you could see it was very heavy and he would rest with his load on the stone seats that have been created on the sides of all Nepali trails especially for weary travellers. Woman with traditional clothing and earrings posing in her doorway. We arrived in Deorali. I have been there 6 times before. This time it was a shock to arrive. Almost all of the houses were collapsed or too damaged to restore. We visited some families and Rohit translated as they explained what they were experiencing following the earthquake and how they and their children were trying to survive. Women living in her plastic shelter that is too small to store all the family clothing and blankets. 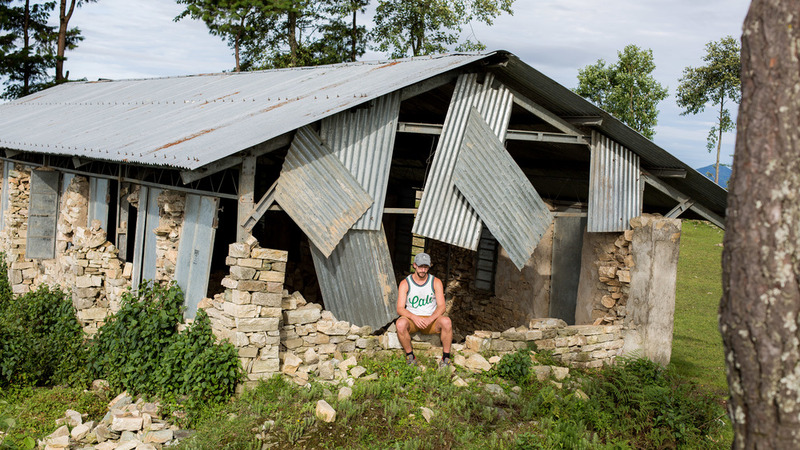 Thinking about the damage that destroyed the village of Deorali and this school. Seeing the collapsed school building where I had watched children playing and studying one year ago was hard. I sat down to think about all this and came up with the idea that when I organise a trek to bring clients to visit Micro-Care Foundation projects our group members could give a financial donation if they wished to help local people and institutions like this school. The side of this house has completely collapsed. They will slowly demolish it and then try to rebuild this house. Side of the house has completely collapsed. They will slowly demolish it and then try to rebuild this house. We asked what this school could use besides a new building. They let us know materials for sport education would be welcomed. The Nepali government will support the rebuilding but this will take a long time. Even prior to the earthquake, government schools in Nepal were poorly resourced and often offered a limited number of courses and sports facilities. Girl collecting grass from the corn fields to feed the goats. The landscapes were stunningly beautiful. My focus usually goes out to the people and the way they are living. The portraits demonstrate why Nepal, with its simple lifestyle is so interesting for western people to visit. It opens your eyes to the truly important things in life. More about this in following posts when I will explain the work we are doing in Necha. Baby in his basket beside his mother who is working in the field. Our old but strong porter posing with work almost finished. Woman posing with a photo of her son. I took this picture of a traditional celebration last year. Carrying corn home that is just taken from the field. It will be dried and eaten all year round. Older PostStarted our Dutch NGO work from Kathmandu, Nepal. Donaties geven ons de mogelijkheid om hulp te bieden aan scholen, gezinnen en kinderen in Nepal. We houden je graag op de hoogte ! Vul onderstaand je emailadres in. We houden je graag 4 x per jaar d.m.v. een email op de hoogte van onze activiteiten in Nepal en hoe de donaties daar besteed worden. Namens ons en de mensen in Nepal, bedankt ! Bedankt voor je hulp aan Nepal!